Our craps classes are intense weekend craps lessons offering extensive hands-on individual instruction in the Golden Touch philosophy and the physics of dice control. You will walk away from our classes knowing how to win at craps and with a variety of supports to help you outside the classroom including an optional practice rig (additional charge) and access to our members-only pages. There are many craps lessons and classes out there - but only one that teaches you the Golden Touch. Choose one of the packages below and take control of the dice. Henry Tamburin's Golden Touch Blackjack... a new, extremely easy, advantage-play technique for blackjack! Learn Speed Count and the Optimum Basic Strategy created by Dan Pronovost. 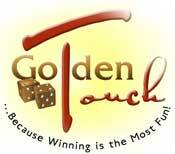 Learn more here: www.GoldenTouchBlackjack.com. Meet and Greet on Friday evening, free for students. Not available in Memphis, Tunica or Chicago. Students can bring guests. In addition, GTC members and non-members are welcome to attend. The cost is $15 per person for non-students. Private Complimentary Lunch with Dom, the instructors and your individual mentors on Saturday and Sunday is a great informal way to talk, ask questions, exchange ideas in a relaxed atmosphere. The cost is $50 per day. This option is not available in Memphis/Tunica.